Holy C***, Bring On The Duck Fat! I keep getting turnips in my organic vegetable basket. I am going to be honest here and say; I am impartial to turnips. Being impartial results in being unmoved by these root vegetables generally I am at odds with how to include them into my diet. Luckily for me, I have been trying to keep with a paleo/primal way of eating since the new year. This means that some of my favorites things, like hummus and mashed potatoes are a no go. So what to do with a bunch of turnips a hankering for mashed potatoes and some left over tahini? Bring on the Duck Fat! 3. Add duck fat, tahini and chives. 4. Beat with hand blender until desired consistency is achieved. I think this recipe would also taste great if made with bacon fat and garlic, instead of duck fat and chives. The taste of the turnips is strong but delicious when served with a nice piece of grass fed beef. 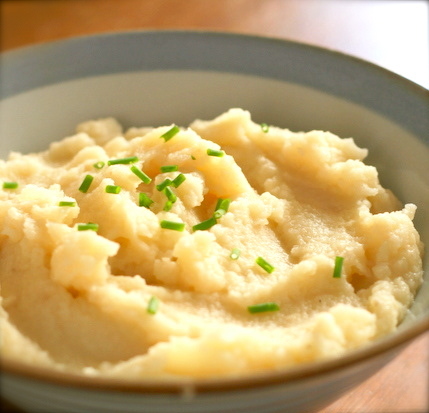 What makes me happy is that I can keep adding different ingredients to this turnips mash much like I use to do with hummus. Until then be adventurous and try something new like I did. You may be pleasantly surprised. Duck fat makes everything taste better! All the chefs I know say their secret to making a fantastic meal is adding duck fat. My cousin’s boyfriend, who is a chef, keeps a jar of duck fat in their fridge and adds it to everything he cooks, much to my poor cousin’s chagrin! Not the healthiest choice, but it tastes soooo fantastic! Likely no. I was using some duck fat that I bought from our organic butcher.